While it is great to have a fluidic design that caters to users across diverse devices and platforms, the real question is do you really need it? Designing a responsive website is far different from designing a conventional website. Your web designing company may need to deploy more experts or provide additional training to the existing team. This may lead to additional expenses. 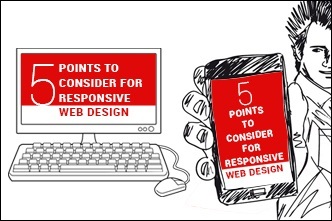 So, you may have to weigh the benefits of having a responsive website against a normal one. If you have a major chunk of traffic coming from handheld devices, then investing in a fluidic web design may be a good idea. Are You Willing to Forgo Certain Features? Responsive website means being light on content, media and design. You may have to forgo certain interactive features as they might increase loading time, which often puts off the user. If such features are integral to your business, then forgoing them on your website may impact your business. If you think such limitations on design may hamper your business, then it is best to go for a desktop version only. You should give utmost priority to testing of the responsive website. The whole purpose of a fluid design is that it should perform across all devices and platforms. Use Google analytics to know which are the browsers that get you traffic. The website should be able to open multiple layout versions according to the device in use. Will You be Able to Harness Opportunity? The purpose of a responsive website is to fetch more users to your website through diverse channels. This may naturally turn into more business for you. In short, a responsive website opens doors for more business opportunity. The question is, are you ready to take on the additional user load? Are You Willing to Be Flexible with Your Design? Responsive web design is not a one-time job. You need to take into account changing trends and incorporate them in the design, from time to time. Similarly, it is important to keep the performance up all time, across all devices.